For our ancestors, collective intelligence was a normal part of life. We see it today as the mysterious force that enables flocks of birds, swarms of bees, and schools of fish to function together in perfect synchrony, communicating and cooperating at some undetectable level. At its most subtle, it’s an instantaneous knowing, shared by members of a group, of the wisest course of action that will benefit all. 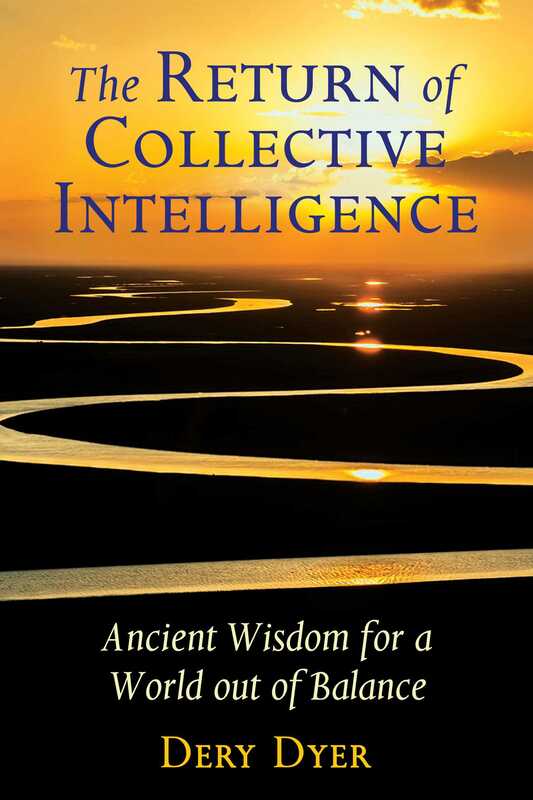 As Dery Dyer reveals, collective intelligence still resides within each of us, and it is the key to restoring balance and harmony to our world. She shows how it occurs spontaneously when individuals who share a need and a purpose instinctively “self-organize” into a group and function with no leader or central authority. Such groups exhibit abilities much greater than what any of their members possess individually--or what can be replicated with artificial intelligence. Dyer explains, due to an unquestioning dependence on technology, modern humanity has forgotten how to connect with collective intelligence and fallen into collective stupidity, otherwise known as mob mind or groupthink, which is now endangering the interconnected web of life on Earth. Drawing on recent findings in New Paradigm science, traditional teachings from indigenous groups, as well as sacred geometry, deep ecology, and expanded states of consciousness, the author shows how the ability to think and act collectively for the highest good is hardwired in all living beings. She explains how to release ourselves from enslavement by technology and use it more wisely toward the betterment of all life. Underscoring the vital importance of ceremony, pilgrimage, and initiation, she offers ways for us to reconnect to the infinite source of wisdom that fuels collective intelligence and which manifests everywhere in the natural world. Revealing that once we relearn how to hear the Earth, we can heal the Earth, Dyer shows how each of us has a vital role to play in restoring our world to wholeness. We educators have to remember that formal education is only a very recent addition to a process of learning that has taken place over hundreds of thousands of years of human evolution. We must look for ways to connect learning as we see it with those much older roots. What David Bohm envisions as a “new kind of intelligence” is in fact ancient. It’s the way our ancestors learned to live in the world before the world became so complex that we needed schools and teachers to interpret it for us. We once experienced the world directly. Now we learn about it from a remote vantage point many times removed from it. What we’re required to know comes packed in layers of information that only teachers trained in countless diverse areas can decipher. Knowledge has become so specialized that it can be transmitted only by a hierarchy of initiated intermediaries; in fact, most of us will never be able to acquire even a fraction of the knowledge that makes up our world. We’ve been cut off from our sources of knowing as surely as we’ve been severed from our spiritual guidance. Tragically, this reinforces the boxes in our brains through which we perceive the world, intensifying our feeling of separation from All That Is. Contemporary education serves the status quo. But is it equipping us to live in harmony with the Earth and our fellow beings? Is it helping us solve our most urgent problems, or is it simply perpetuating the Old Paradigm . . . and the old problems? Confined by specialized straitjackets, our fragmented modern minds are simply too limited, their focus too narrow, to come up with anything but fragmentary solutions--which is undoubtedly why our problems are not only persisting, but growing. And it’s why many new thinkers are taking a closer look at old ways of learning. Modern educators struggle to teach. But traditional people and the new science insist that we can’t not learn. Watch a kitten, puppy, baby bird, or human child: they are driven by curiosity to know their world. Sometimes, their curiosity gets them in trouble--but if they manage to survive their more hazardous encounters with life, they always, inevitably, learn. “The ability to learn [something new] is a principle common to the whole of humanity,” David Bohm says. “Thus, it is well known that a child learns to walk, to talk, and to know his way around the world just by trying something and seeing what happens, then modifying what he does (or thinks) in accordance with what has actually happened. In this way, he spends his first few years in a wonderfully creative way, discovering all sorts of things that are new to him. Adults cannot not learn, either. Curiosity continues to drive human behavior throughout life, and when unfettered, can lead the learner in unimagined directions. Curiosity leads naturally to the kind of group interaction that produces collective intelligence. When people come together in curiosity rather than certainty, magic happens. Sources of deep wisdom are tapped; totally new ideas and solutions emerge. Discoveries in neurobiology confirm that we can’t not learn. Biologist Humberto Maturana showed that all living organisms become “structurally coupled” to their environment at a cellular level; we are “hard-wired” to learn, easily, naturally, and continuously. The good news is that we can learn everything we need to know in spite of what Freire calls “the banking system of education” in the industrialized world. The bad news is that some of what we’re “structurally coupling” to may end up threatening our eventual survival. We’ll be looking more closely at this in Part Two. Dery Dyer is former editor and publisher of Costa Rica’s award-winning English-language newspaper, The Tico Times, where she worked for over 40 years. She holds degrees in literature and journalism from U.S. and Costa Rican universities and has studied indigenous spirituality in many different parts of the world. She lives in Costa Rica.